Born in 1951. Founder of the Rakurs photography club (Cheboksary, 1978). Participant in the Fakt group. 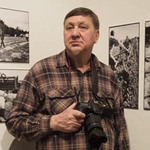 From the end of the 1970s and in the 1980s he was the ideological inspiration behind and organizer of the photography movement in the Republic of Chuvashia. Right up until the fall of the USSR he organized numerous photography festivals, exhibitions, meetings and seminars. A participant in international, Russian and regional exhibitions. Lives and works in Cheboksary.